A lightweight, high-strength protection for your instrument. Visesnut Guitar Cases have a built-in mechanism; with one simple movement you create a perfect fit. 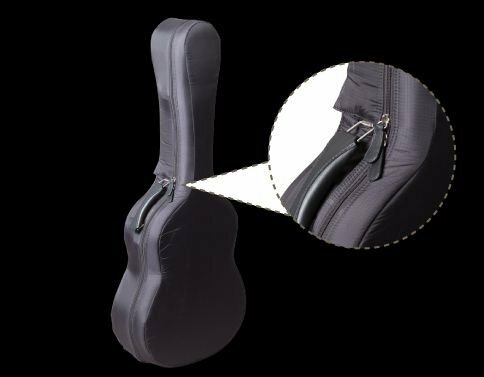 In combination with the protective interior padding a Visesnut Guitar Case ensures the least possible movement of your guitar, inside the case. See demonstration video below this page. Thanks to the double-walled structure for enhanced protection, the Visesnut Guitar Case body withstands stress loads as well as absorbs impact from drops and shocks. The double-walled structure also acts as an insulation to minimize the effect of sudden temperature changes on the guitar. The Visesnut Guitar Case is the ideal flight case. It weights 7 pounds, offers high-strength protection and custom fit. It comes with beautiful stainless hardware and a handcrafted genuine leather handle. Although designed for horizontal access, all Visesnut cases are well balanced to stand firmly in both horizontal or vertical positions. According to the information provided by the Transportation Security Administration of the United States (TSA) on its website, the TSA may physically open a passengers’ luggage for inspection. Covering your Visesnut case with a case cover and securing the case cover zippers with a TSA-approved lock (not included), you may leave the case unlocked for inspection.